I'm please with with both the new painting technique and the basing scheme on these figures. I was worried that the uniform and base would not contrast but things worked well. One thing that really surprised me was how much research I had to do! It took a while to get the colour scheme for the radio set, the mortar round and the carrying case. Far more than I imagined would be required. As I normally paint medieval figures I'd become used to the relative freedom of the period. Anyway the next step is to try an paint a few universal carriers to go with the mortar team. Then I have to decide whether to paint and army or sell these. Inspiring and Im convinced PP is the way to go with my 8th army. Could you let me know the paints you used? Iraqi sand formed the base colour. I washed it - http://bit.ly/focBB6 for details - then highlighted with the base colour and lightened it with a pale cream for the final highlights. Great thanks. Fits in very nicely with my platoon of PP 8th army that has just arrived. Very nice indeed. 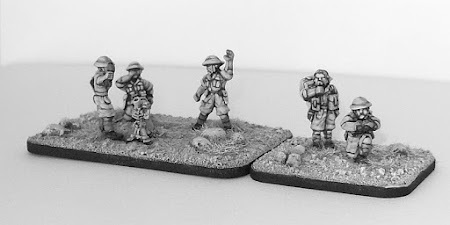 By the way Plastic Soldier Company have been bringing out 15mm fastbuild tanks 3 to a box. Don't know if they do figures too? They certainly do figures. They have Russians and Germans with Brits planned soon. The tanks I bought are 5 to a box. Zvezda are doing single snap together tanks and vehicles in 15 mm.